As far as I can remember, I’ve only been punched in the face once. It was in elementary school on the playground in the midst of an argument over something that I did. I was in the wrong in the situation, but that was the only time that I feel as though as was the recipient of violence. For most people, the term violence is defined by these types of tangible things: fights, stabbings, shootings. While those are certainly violent acts, perhaps they don’t tell a complete story about the nature of violence, particularly as it relates to the workplace. 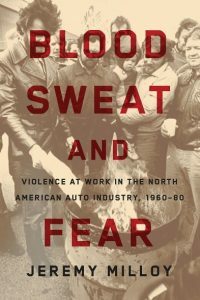 In his new book Blood, Sweat, and Fear: Violence at Work in the North American Auto Industry, 1960-1980, Jeremy Milloy re-examines the term violence and how it played out in the post-war years. In pointing out that the industry has a violent history, Milloy notes that workplace violence goes beyond the strikes and riots that have been central to labour history and encourages readers to explore the structures and dynamics that have promoted violence in the workplace. Throughout the book, Milloy challenges the reader to re-consider what constitutes violence. Whether this be the promotion of unsafe and hazardous working conditions to wage suppression to racial and gender tensions, he re-examines how we define violence and how that has compromised workers. And while the book focuses on the auto industry, the conditions and structures at place have wide ranging influence. Blood, Sweat, and Fear tells this story in a detailed, yet succinct, manner. From its initial hook looking at the push in some states to allow guns in the workplace through the conclusion, Milloy explores the complicated world of the workplace in way that is both engaging and easy to follow. Where some labour histories can get a little too ‘inside baseball,’ Blood, Sweat, and Fear welcomes the reader and takes them through this intriguing story. In this episode of the History Slam, I talk with Jeremy Milloy about the book. We talk about what constitutes violence in the workplace, why he chose to study the auto industry, and the decline of collectivity. We also chat about violence’s role in productivity, how gender and race influence violence, and how universality of these issues. Sean Graham is an editor with Activehistory.ca and host/producer of the History Slam.